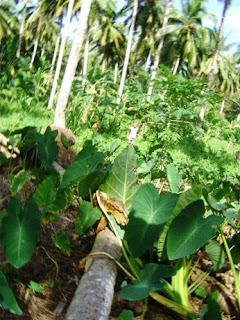 I spent last night in the village, and soon after waking up this morning, I set out with Mele, Oge, Akanese, and Phil’s sister Fipe to the maumaga or plantation. It was baby Leme’s first birthday today, so we needed to pick up some taro and coconuts for the meal along with supplies for the rest of the week. 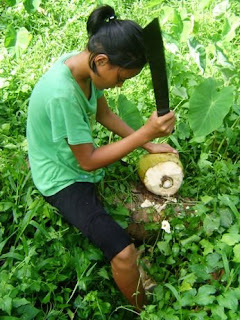 Oge went to work on harvesting the taro, and I shadowed Fipe as she collected coconuts. Akanese tagged along too. I’m honestly not sure which of us was more dead weight. Fipe was a sport about it though, and I think she enjoyed the company. Peace Corps are minor celebrities in the village, and I think people enjoy it when we take an interest in what they’re doing. Fipe’s English is mediocre, as is my Samoan, so we tried casual conversation for a bit, but then abandoned talking all together, save for commands or jokes. Fipe is 12 and Akanese is 5, and it’s fascinating how different life is for girls here. 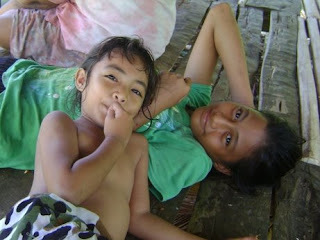 Lots of aspects of life in Samoa are different from life in America, but it’s just so striking when it comes to girlhood. Last night was another siva, and both of them were in their element. Akanese is a bossy little girl, and tends to dictate activities to her friends. Fipe reminds me of my sister in the sense she’s also the boss of all the children under a certain age. I never had any sway over my cousins growing up, but Amanda would show up and they adored her. Fipe and Akanese were out on the dance floor, being cheeky with the boys, being girls. Cut to the plantation today. 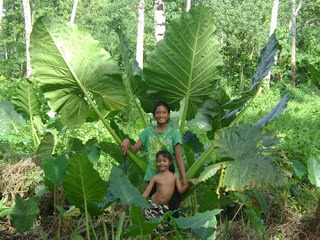 As soon as we get there, Akanese picks up a large knife and starts hacking at a bunch of aloe leaves that are sitting in the fale. 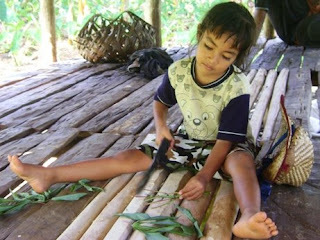 When we head out to collect coconuts, Fipe pries the large knife from Akanese’s hands and gives it to me. Fipe carries a larger machete. And we’re off. I notice that Fipe and I wear the same size shoes. Hers are worn; there are holes in the heels of each. But we traipse through the rocky, uneven maumaga for hours. Akanese often goes completely shoeless. And not just on soft dirt and grass. During training, I’d often see her take off in full sprint over jagged lava rocks and loose gravel, completely unphased by the ground under her feet. As Fipe and I carry coconuts back, she hacks a small strand of the rind off of two, and uses them as strings to tie the coconuts together. She’s still holding the machete, and carrying the third coconut will be awkward. So she thinks about the situation for a beat, and then stabs the machete into the third coconut. Problem solved. Fipe’s not muscular, but she’s buff. During training, me and Phil and his sisters would sit at their house and play games like the one where one person lays their hands on someone else’s, and the person with their hands on the bottom tries to slap the hands on top before the person with the hands on top can move them out of the way (Does this game have a name? I feel like the entire world plays it, but describing it in words is laborious.). In any case, it was almost not fun to play because Phil’s sisters hit hard. Fipe would nail me with a smack to the back of my hand and it was pain. In fact, as we were rolling into the maumaga, she slapped me in the forehead. Hard. I looked over at her and she only says, “Mosquito,” but with a smile, as though the smack was justified, but also satisfying. We go back to the house for Leme’s party, and Fipe and Akanese go back to playing the girly gender role that we expect in America. Fipe goes to serve ice cream, and it’s funny how carrying three ice cream cones and a bowl of peanuts seems just as difficult as the three coconuts and a machete. I hope you’re wearing all your different hats well. Pictures below. Fipe chopping the top of a coconut for immediate drinking. 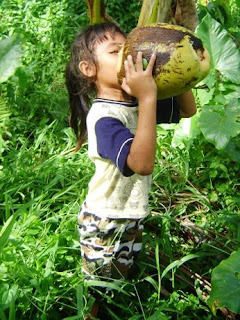 Akanese drinking the coconut from above. I really like this picture. The kid's just so photogenic. Akanese chopping with a knife as long as her arm. Fipe and Akanese in front of a tu'umao (I think?). It's pretty much giant taro. The part you eat is good. Like the missing link between a taro and a potato. At one point Akanese and I were seesawing on the trunk of this palm tree. She is the white spot in the middle of the picture. It's difficult to see when the image is this small, but I think the camera's autofocus found something in the middle of the picture and it resulted in this weird fishbowl effect. Kinda cool. 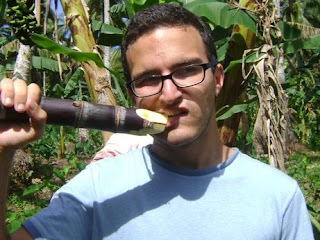 Me eating sugar cane (I think?). Great photos and very funny commentary. But the photo of you eating sugar cane (you think???) is my favorite. Very amusing. You eating anything unknown is mind boggling. Oh how Samoa has changed you! Keep writing. I love reading what you have to share. Your posts make me homesick. This is my favorite post!! I wish I was there with you. Bring back memories with the maumaga and ta'amu stories. Yes, I remembered the mosquitoe forehead slap. It's really true! !